Learn how to stand out as an employer of choice and amplify your Employee Value Proposition (EVP) by keeping company values at your core. What makes your organisation unique? What benefits do you offer employees that other organisations don’t? Your Employee Value Proposition (EVP) encompasses everything that makes your organization one-of-a-kind. Whether it’s free coffee or pet insurance, your EVP is what sets you apart from the competition. Initially, when new starters join your company, clearly express your EVP and focus on the employee experience to make them feel welcomed, inspired and connected to your brand. Company onboarding should be engaging, straightforward and fun. Put your values and people at the centre of everything you do to make sure new starters get up to speed quickly. When we started our own onboarding journey at Reward Gateway, we wanted to make sure new hires felt at home and ready to start their own journey of making the world a better place to work. The first few days of a new hire's start date are perfect for introducing them to your company and your values, though as you know we encourage familiarity with your values all throughout the recruitment process. By keeping your values at the centre of your entire process, the transition is seamless when new hires begin. We all know how much first impressions matter. It’s especially true on a new hire’s first day. And while every company has a different idea of how to engage employees and onboard new-hires, after we did some of our own research we wanted to make sure our onboarding process had the “RG WOW factor.” And it also had to follow our purpose, mission and values and show our culture. Our eight values are important to us and we want new employees to feel connected to them from the start. So, we decided to create value-based welcome packs. 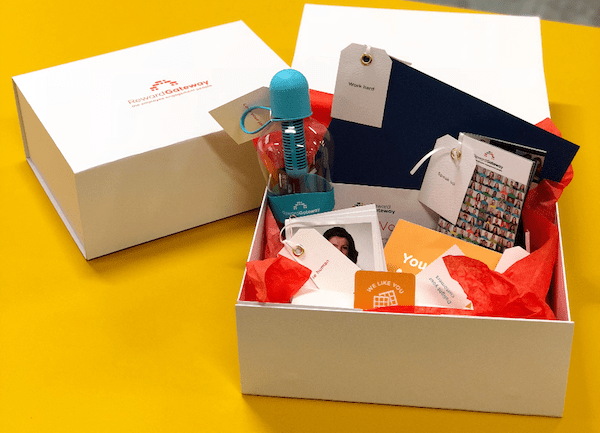 In these new welcome packs, we included eight branded items, each one reflecting a specific value at Reward Gateway from Speak Up, Push the Boundaries, Own It, Think Global, Delight Your Customers, Work Hard, Be Human, and Love Your Job. 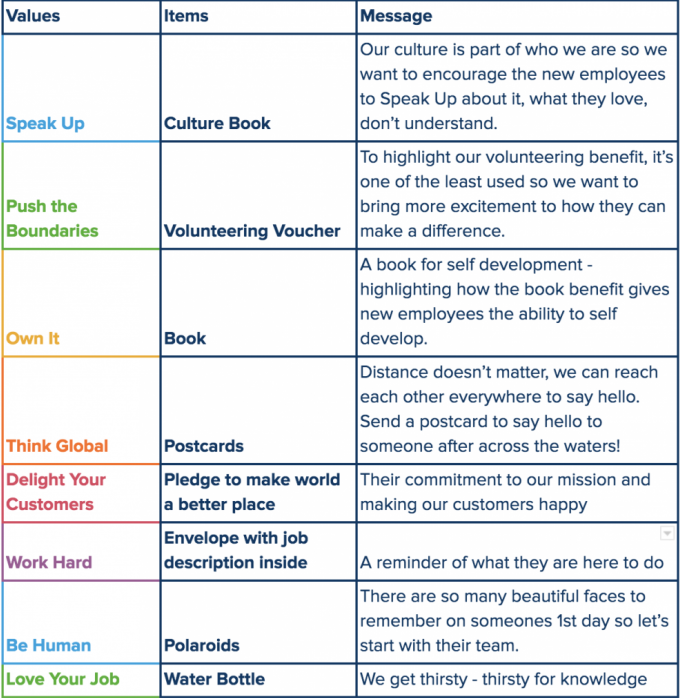 We also attached a message to the values so employees know exactly why they’re getting something. A cool piece of swag only goes so far if there’s no meaning tied to it. The packs also reflect the Engagement Bridge™, which is an essential ingredient in our culture. My biggest piece of advice is: Research, research, research. There are many great ideas out there, but ultimately it’s about picking the ones which are right for your organisation. 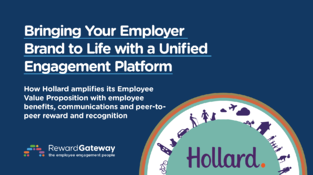 By aligning your onboarding experience to your values and mission, you can introduce your EVP sooner and communicate your employer brand to new team members. Overall, onboarding is an investment in your people. If you truly want to make a big impact on the first day, focus on quality over quantity and give your people some company swag to call their own so they feel like a part of the team. In addition to gifting values-based welcome packs, we also use little communication touches to keep new starters engaged a couple weeks before their start date. We use an onboarding tool called Enboarder which works seamlessly with Reward Gateway’s employee engagement platform. For example, we ask new employees to share fun facts with the People Team which we then use in our People News update on our internal communications blog. By improving the employee experience and communication, organizations can increase employee engagement. Onboarding programs are successful when your newest employees feel empowered by your culture and understand what’s expected of them. 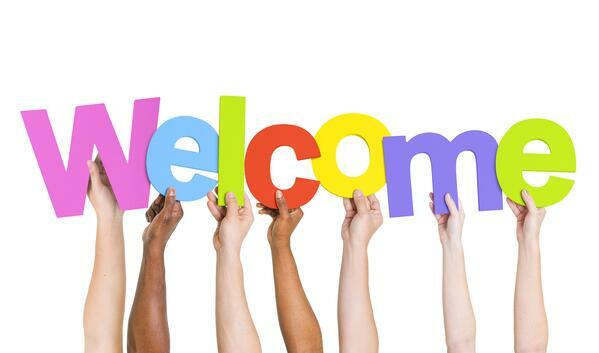 Values-based welcome packs are our way of starting a new hire’s journey to making the world a better place to work. There are countless ways to increase your EVP with unique onboarding techniques that reflect your company culture and values. Got a great onboarding story? We’d love to hear it! Get in touch with me on LinkedIn or leave a comment below.